NEW YORK (CNNMoney) -- Comcast on Thursday decided to get rid of its controversial 250 gigabyte-per-month cap for its broadband customers, replacing it with a usage-based billing system. The company put its current cap in place in 2008. 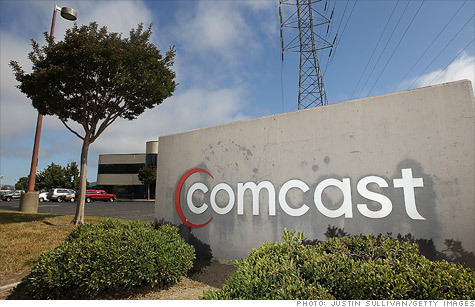 The decision was aimed at a small number of Internet users who Comcast (CMCSA) felt were abusing their all-you-can-eat privileges by downloading a steady stream of HD movies from peer-to-peer networks. That heavy usage was limiting the bandwidth available for average customers. The 250 GB cap was designed to be a large one that the average consumer wouldn't come close to hitting in a month. In four short years, it became a much tighter limit, thanks to customers gobbling up an ever-growing stream of data. Apple (AAPL, Fortune 500) iPads, Netflix (NFLX) and other online video services helped customers rack up those gigabytes. Video drove the majority of consumer Internet traffic for the first time in 2010, making up 53% of all uploads and downloads, according to the latest data from Cisco's (CSCO, Fortune 500) Visual Networking index. By 2015, video traffic is on to track to more than quadruple, and industry forecasters predict that Internet traffic will be 90% video. As a result, Comcast said it would lift its cap and instead put in place a tiered system like the ones Verizon (VZ, Fortune 500) and AT&T (T, Fortune 500) use for their wireless data services. Though Comcast, the country's largest broadband provider, said it hasn't reached a decision on how it will implement the tiers, it will be pilot-testing two possible solutions in yet-to-be-determined markets. The first program will set different allotments for different tiers of service, starting at 300 GB per month, and charge customers for additional blocks of usage when they go over. The example the company gave was $10 more for 50 GB of additional data. The second approach would give everyone 300 GB per month, and then charge for additional usage in blocks. "Our goal with this improved approach, these consumer trials, and our continued investment in our network is to create products that meet the needs of all of our residential customers (even the heaviest users) and provide everyone with a choice," Cathy Avgiris, head of Comcast Cable, said in a blog post. As rivals' content services have pushed customers up against their cap, Comcast has faced scrutiny for treating its own Xfinity services differently. For instance, video downloads from Xfinity's Microsoft (MSFT, Fortune 500) Xbox app do not count against customers' monthly data allotment. Netflix CEO Reed Hastings has complained that, in doing so, Comcast is violating net neutrality rules. The company referenced that gripe in its statement about its new broadband approach. "Some of the conversation around our new product introductions focused on our data usage threshold, rather than on the exciting opportunities we are offering our customers," Avgiris wrote. Comcast will join Time Warner Cable (TWC, Fortune 500) and a handful of other service providers in switching to a usage-based pricing model. Just as mobile data is overloading wireless networks, fixed broadband lines are also struggling to cope with the increase in video watching. By 2015, 1 million minutes of video -- the equivalent of 674 consecutive days of viewing -- will cross the Internet every second. The community of online video users will double to just over 1 billion people, Cisco predicts. Though YouTube, live sports, and video calling are all growing, more than half of Internet video will be made up of long-form streaming videos, such as movies and TV shows delivered by services like Hulu and Netflix. That means service providers, like wireless carriers, will have to get creative in how they deliver broadband to their customers.